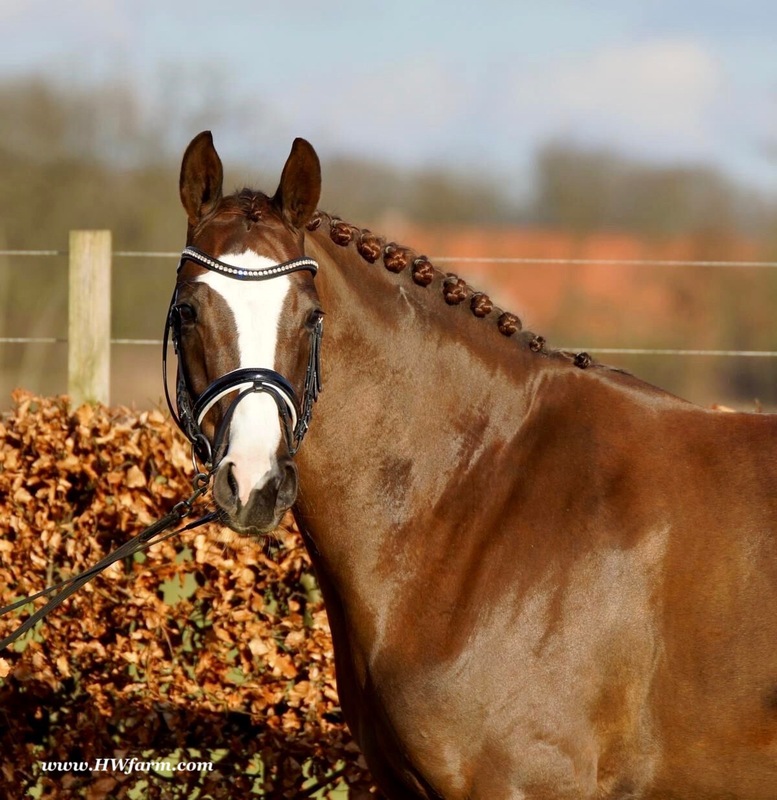 Quality Time HW, liver chestnut Oldenburg mare, by 3 x Westphalian Champion & ViceBundesChampion Quotenkönig x Galliani Biolley, born in 2014, standing approximately 162 cm or 16 hands. 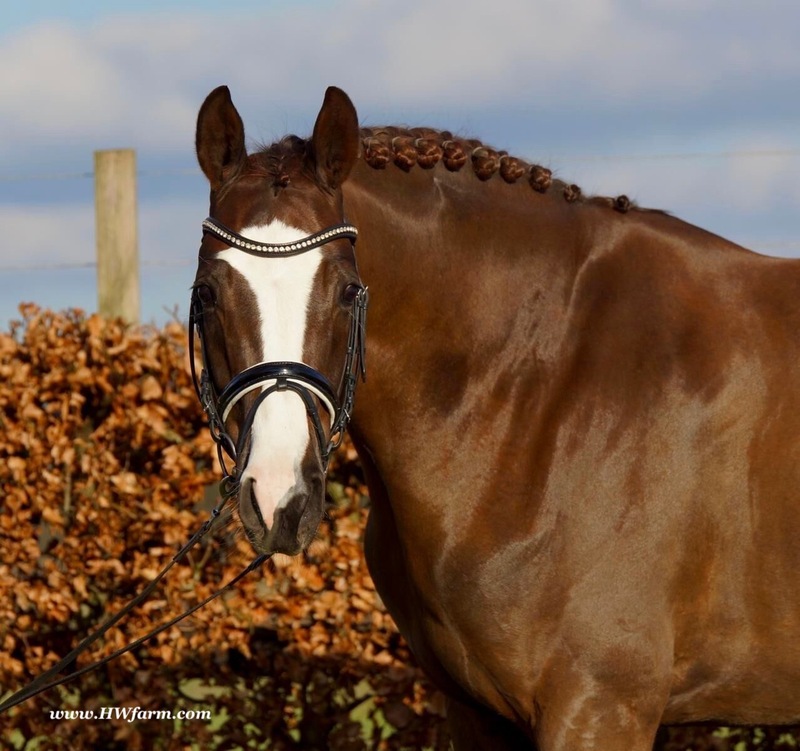 Premium bloodlines, looks and movement, a top class future FEI horse, sire and dam herself, were super successful at the WorldChampionships of the Young dressage horses! 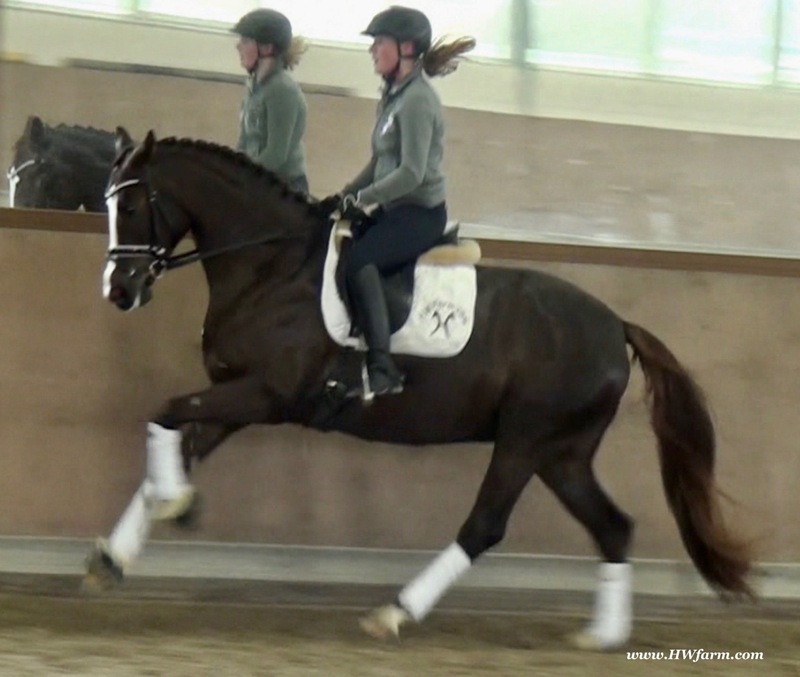 Quality Time HW's sire is Quotenkönig, Vice Bundeschampion 2012, Westphalian Champion 2012, 2013 and 2014. 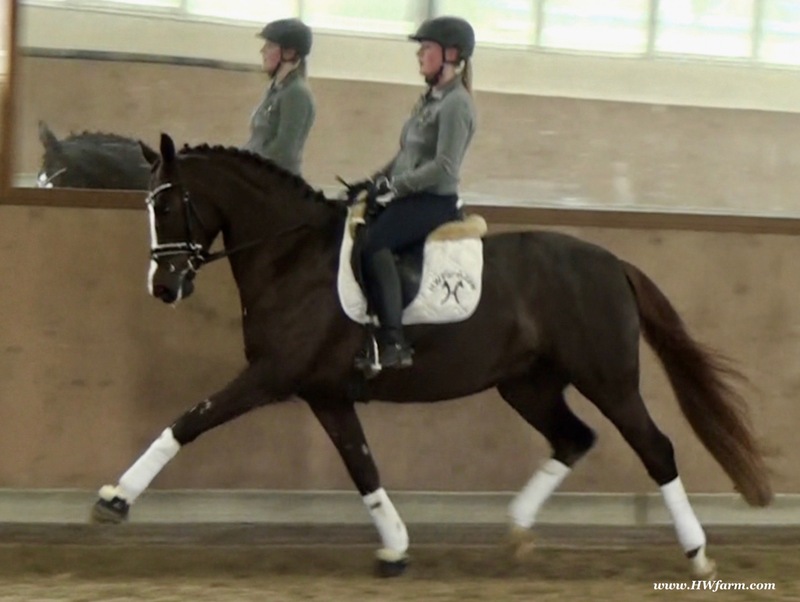 BundesChampionat 2015, 4th place, WorldChampionship 2015, 8th place in the final round, victories in 3rd and 4th levels, WorldChampionship 2016, 4th place, multiple S & M Dressage victories and counting! Quotenkönig's dam is "St.Pr.St. Fleet-Street", 1. Reserve-Champion (Elite) of the mare performance testing in the year 2006 and she participated at the Bundeschampionat as well. She scored an amazing 8.99 at her performance testing. She is by the famous Fürst Piccolo, a 100 Day Performance Test Winner! 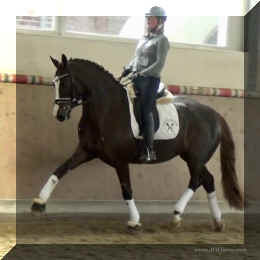 Fürst Piccolo's sire Fidermark was the vice champion of the NRW approvals in 1994 and won the Warendorf state stallion performance test with a big margin in 1995. Further successes followed in 1996. He dominated the "Optimum of Westphalian Riding Horses" sovereignty in Munster . He also became the Buneschampion in his home town of Warendorf . 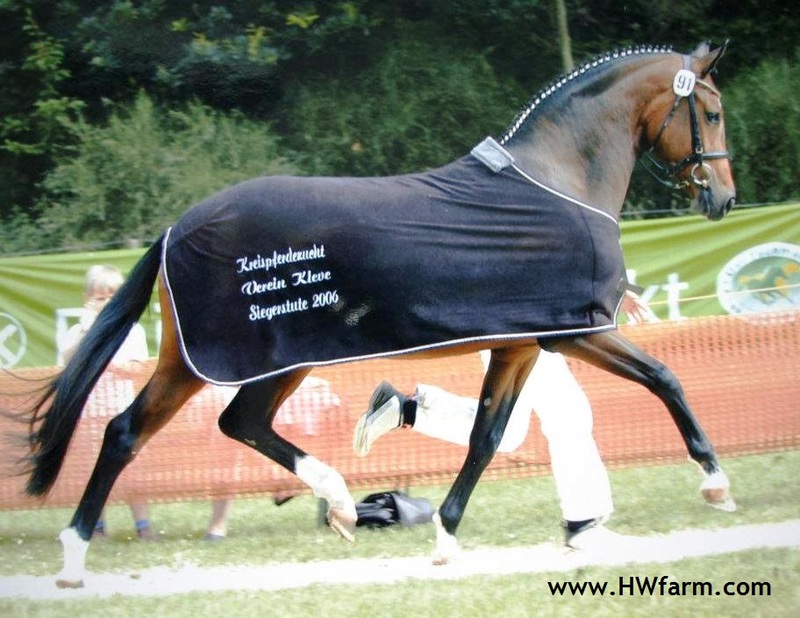 He then went on to win the LVM stallion championship in Munster Handorf. He has had many wins in the Prix St George and Intermediaire I under Marlies Van Baalen and he is trained by Johann Hinnemann. In 2003 he made his debut successfully at Grand Prix. His first foal crops produced sensational foals. 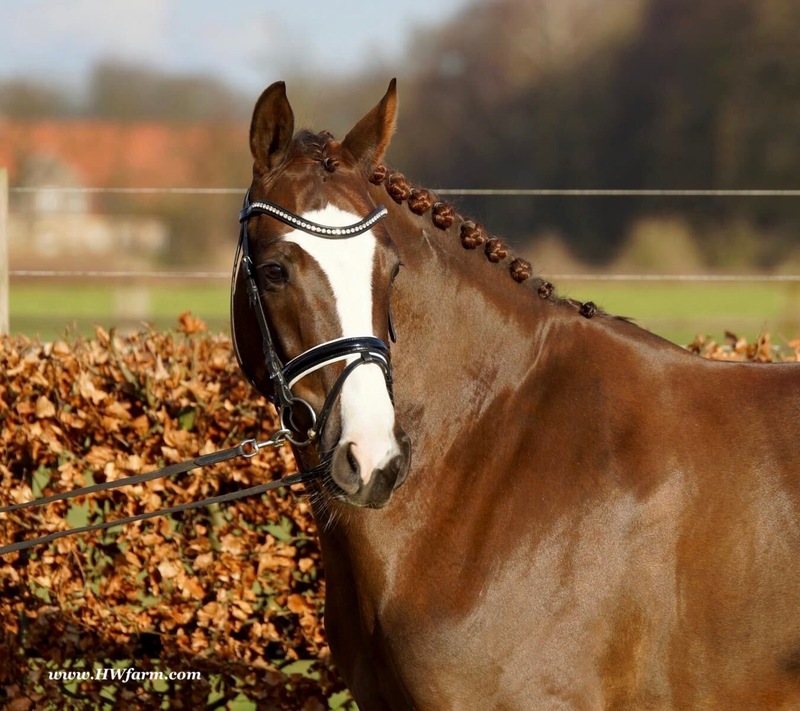 They dominated the Westphalian Foal shows and the NRW elite foal auctions. In 1998 his first approved son Fein Sinn won the 100 day test, the first of several including the impressive moving Fürst Piccolo. He has over 15 licensed sons and many state premium mares to his credit already. 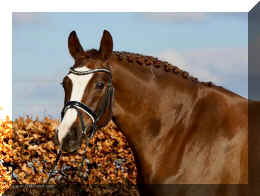 He is a sire who will dominate German breeding for many years to come. He is ranked highly on the FN breeding values list. The dam sire Mephistopheles, a son of the Trakehner Mackensen derives from a Romadour II mare, establishing a blood connection to the paternal side via Rheingold. Mephistopheles sired the performance test winner Jacquare. 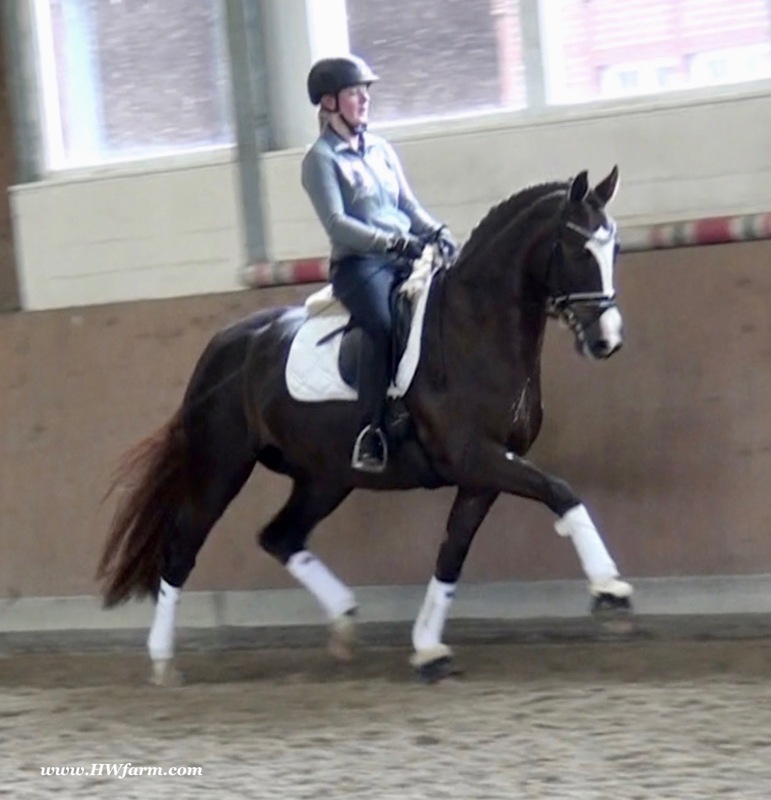 Rembrandt in the third generation was a performance test winner with Trakehner blood. 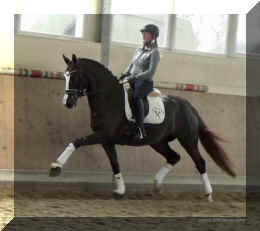 Fürst Piccolo was a premium stallion at the NRW main approval in 1999 and won the 100 day test in 2000 with high scores. He is an amazing moving stallion and his first few foal crops have dominated the Westphalian elite foal auctions. 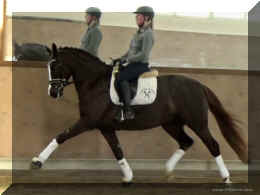 Quotenkönig's grand dam is the mother of "Feedback", by Fidertanz, he was the reserve winner of the NRW-stallion licensing 2009. 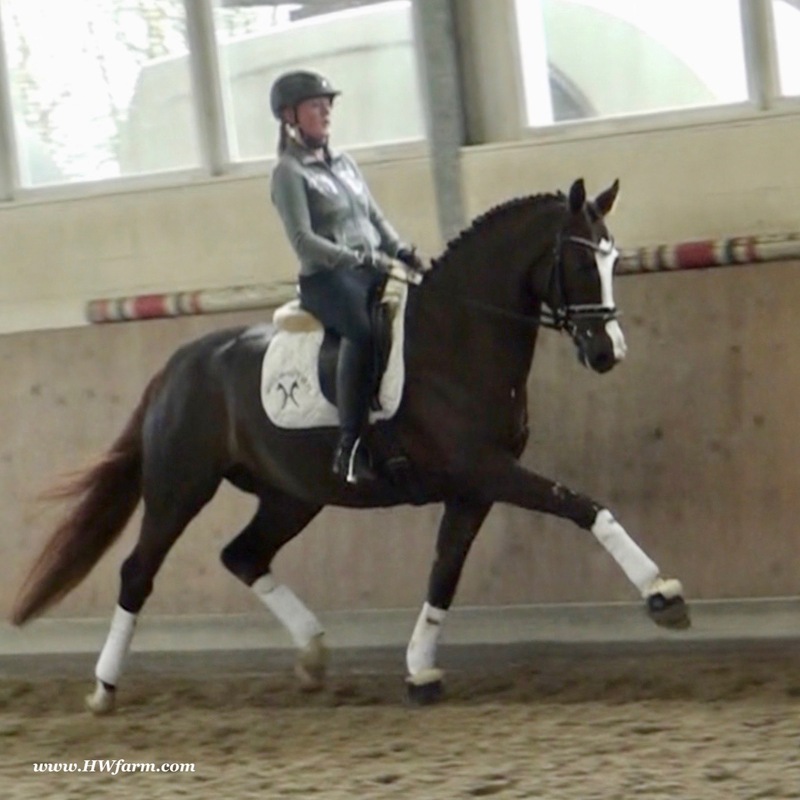 After victories in riding horse tests and the Federal Championship qualifying with a score of 8.6, underlined its exceptional quality of Feedback with a superb 30-day test in Neustadt / Dosse. He received the best grade point average of all stallions. The descendants of the second NRW reserve winner in 2009 are eagerly awaited. 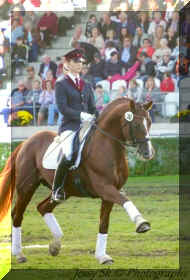 Fidertanz father, the NRW champion stallion in 2004, presented again in 2010 and numerous top foals approved sons. Feedbacks mother, Conn. Pr.St. Scarlett was first reserve champion mare in her circle, is the parent of the premium stallion Fiderhit, the champion mare St.Pr.St. Fleet Street and many winning foals. 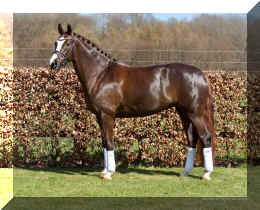 Dam's sire Sandro Hit was Bundes champion six-year old and World champion of the young horses. Among the best known children of the stallion are the champion stallion Sir Donnerhall as well as the record mare Poetin. The Contender-Holstein and Landgraf lines round out the third and fourth generation of the pedigree. Quotenkönig (King of hearts!) 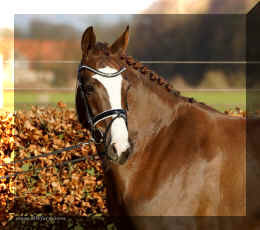 is a picture perfect and absolutely stunning young stallion. 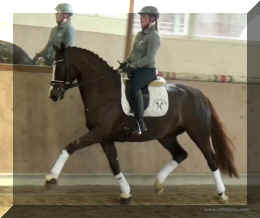 He is a favorite of the NRW stallion auditions. Superb gentleman with 3 way above average gaits. 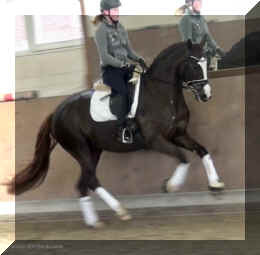 He impresses everybody with his cat like movement, super free shoulder and unbelievable active hind end. He is one of a kind in movement, dynamic, charm and esprit. Quality Time HW's dam is Gallartica Biolley, also named Diva, is extremely attractive in appearance, intelligent and eager to learn. Supple and dynamic, she lifts off the ground with unbelievable lightness. 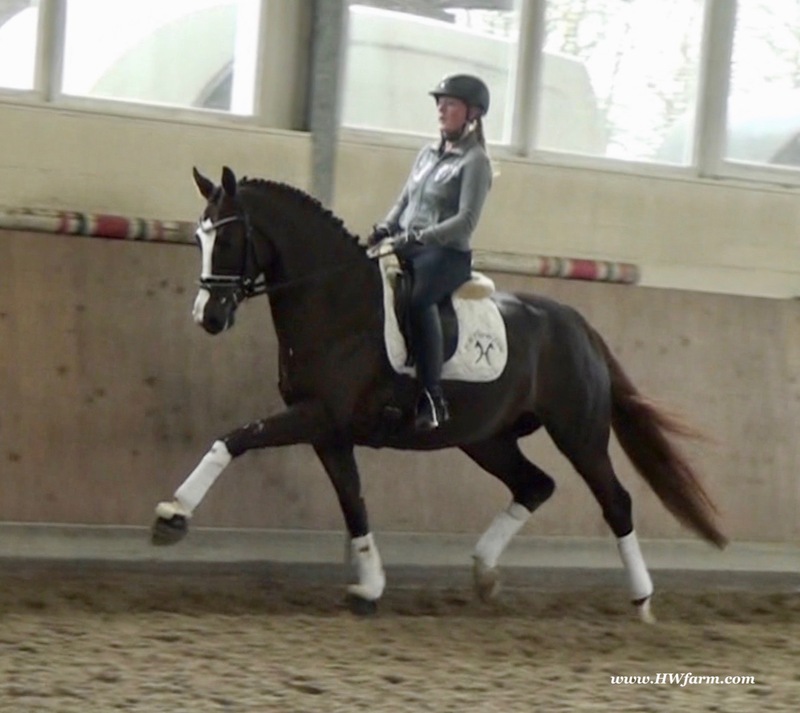 She knows how to put on a first class presentation by showing off her gaits. As expected with such a pedigree, she possesses first-class rideability values. 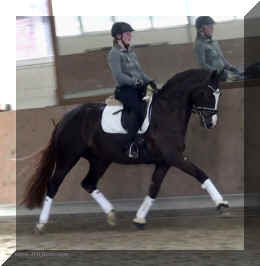 The sire Galliani Bioley is a stallion that associates a high amount of charisma and elegance. 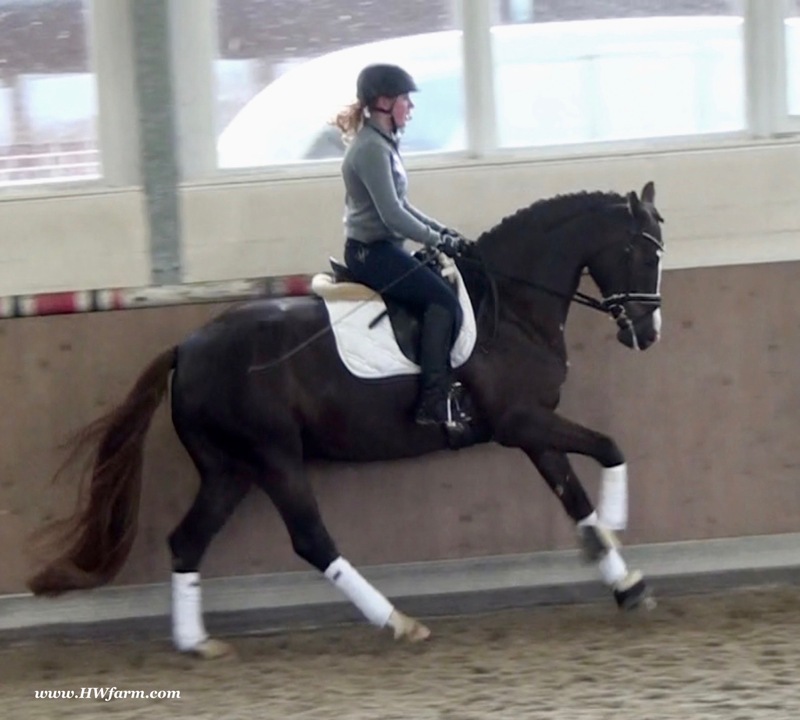 He seems to have been born with the ability to collect and with the talent for the highest dressage level. 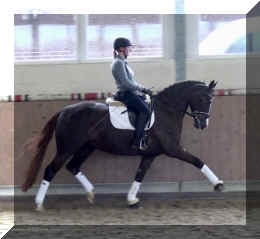 He convinces with three equally and excellent paces and an amazing talent for passage and piaffe. 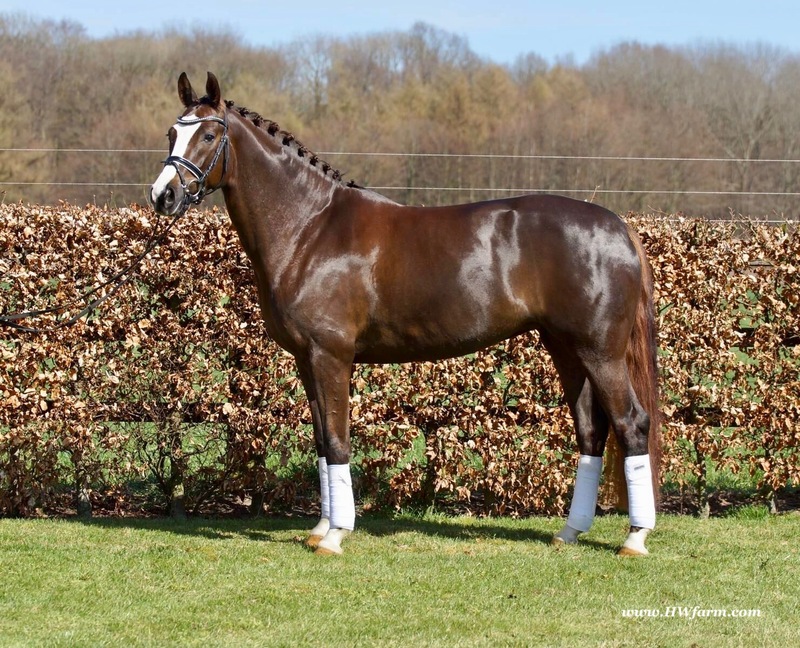 This stallion already demonstrated top performance outings such as a brilliant mark of 80.08% at the WM Verden of the Six-Year-Olds in 2012, a victory at the CDIYH at Leudelange (Luxembourg - 2012). 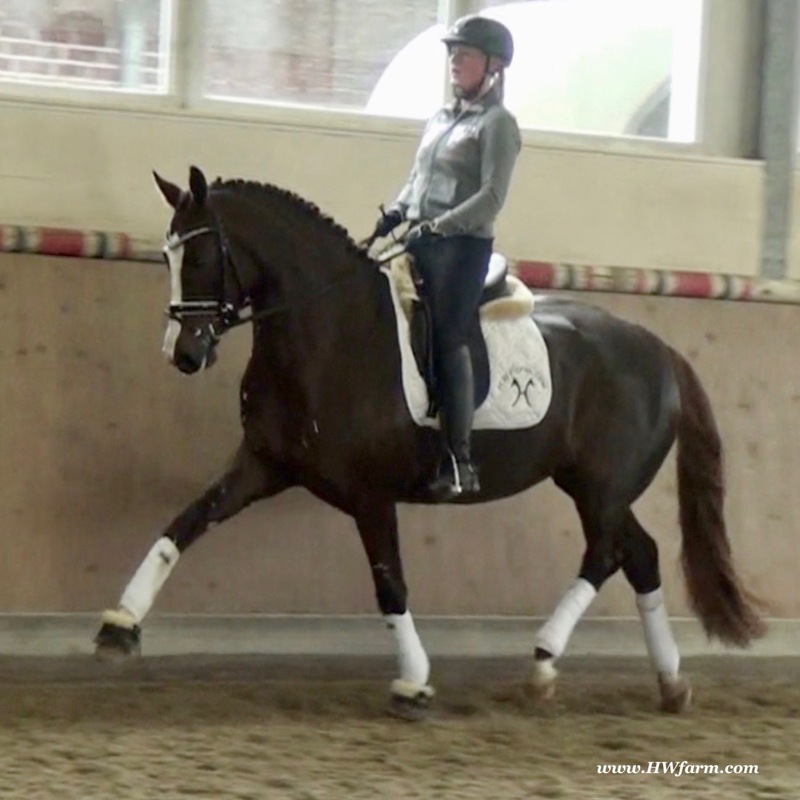 In 2012 he has also been the nations champion during the Belgian Championships and the Cup of Belgium of the six-year-old dressage horses. In 2013 and 2014, he had won several dressage ad-vanced S- and Inter I- level, nowadays Katrien Verreet is competing successfully towards Grand Prix level! His pedigree is synonymous with performance at the highest level. The Sire of Galliani Biolley is nonetheless the world famous Sir Donnerhall I. This stallion has it all and attracts success like a magnet. 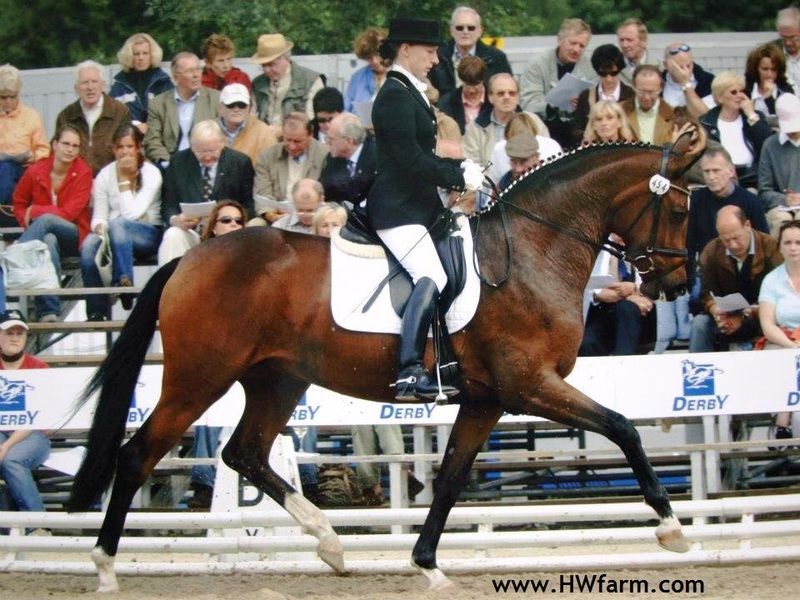 He was the 2nd Reserve Champion of the 2003 Oldenburg Licensing in Vechta and won his 70-day test in Adelheidsdorf in 2005 with a record dressage index of 163 points. 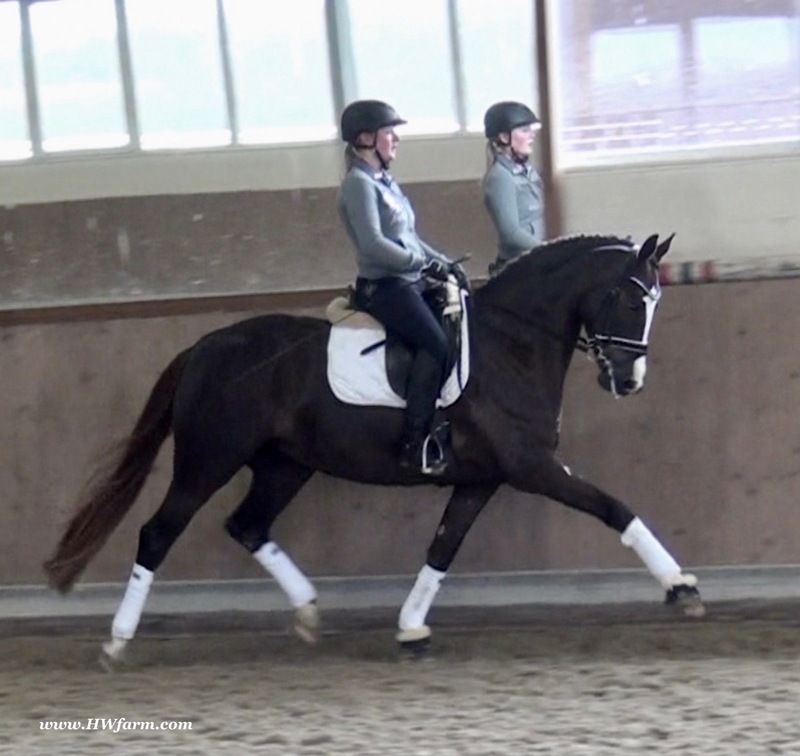 Winner of the Oldenburg State Championships in 2005 and Vice World Champion of the 2006 World Championships of Young Dressage Horses in Verden with a 9.2 score. 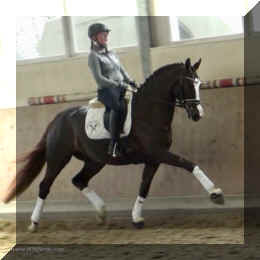 Also in 2006, he became Bundeschampion of the five-year old dressage horses. 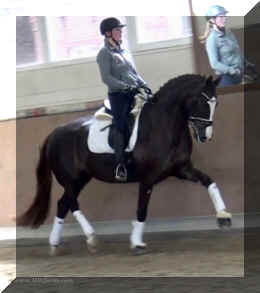 He is showing excellent rideability, rhythm and suppleness and reveals his top quality at all his appearances. Meanwhile, more than 30 of Sir Donner-hall I's sons have been licensed. 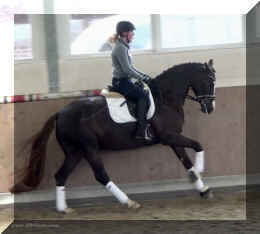 Sir Donnerhall I is an exceptional breeding and competition stallion. Galliani Biolley's mother, Lanciana Lady Cavalor, is by Lanciano. Lanciano is one of the most used sires in Europe. He passes on his dynamism, brilliant movements and steadfast reliability. 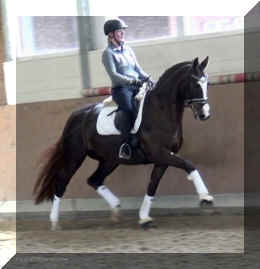 Lanciano is firmly es-tablished in the breeding world and is a pacemaker of the modern riding horse type. 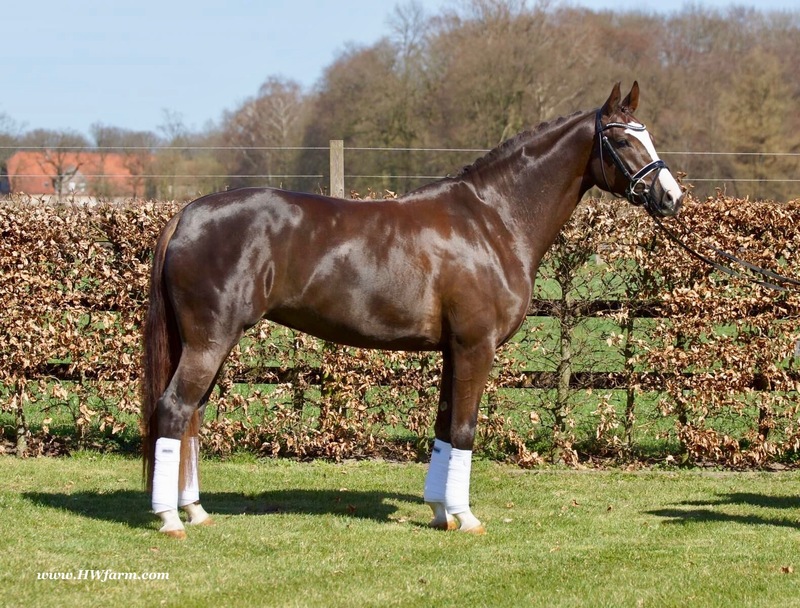 The dam Dolce-Vita Biolley by Florestan-I is a real stallion maker as she's also the mother of Bailamos Biolley and Thorgal Biolley. 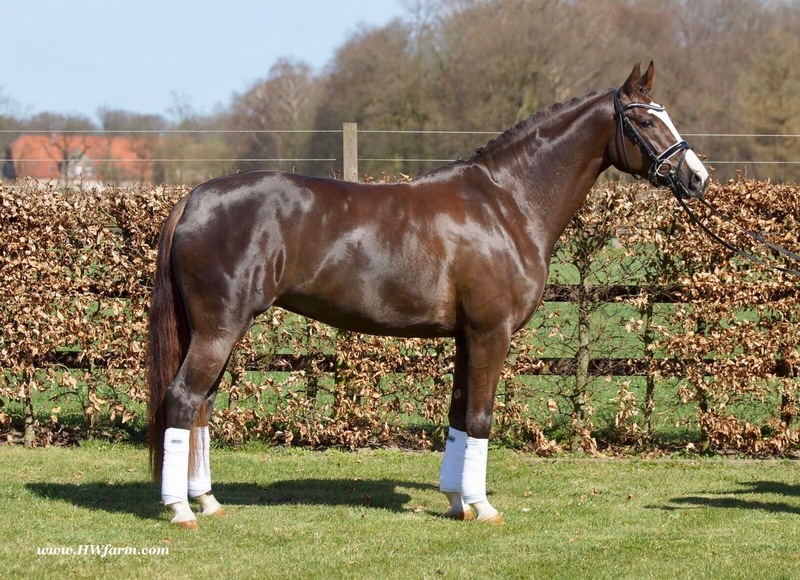 Florestan-I is the all-embracing number one stallion at the NRW State Stud Warendorf, well known for his hereditary transmission, especially of temperament and character. Over more than 80 sons have been licensed, 190 mares awarded State Premium and 1620 offspring are registered as competition horses. 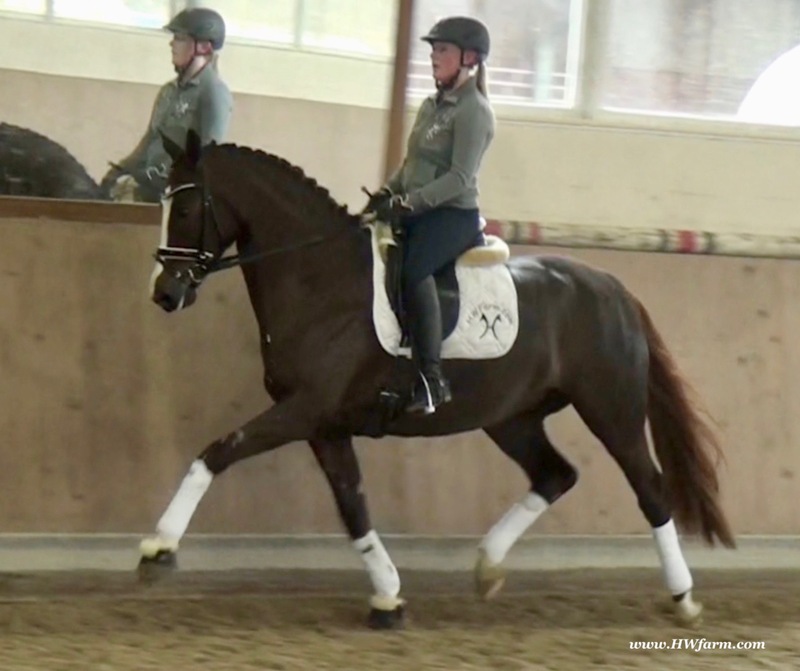 Quality Time HW is a horse of definite Champion quality, world-famous dressage lines and is equipped absolutely phenomenal gaits. Always impressive, with 100% rideability, character and very strong nerves. Her stallion type (she is a mare!!) will mesmerize everybody alike and she is dressed in a beautiful liver chestnut coat with lots of chrome. She is so beautiful. 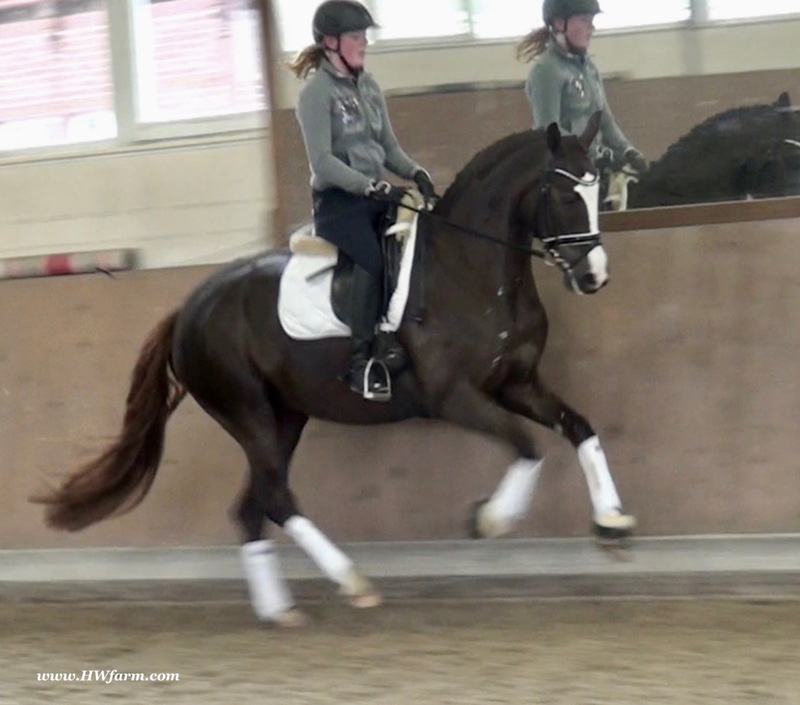 Quality Time HW has super fancy, cat like/elastic, swinging movements and knows to impress due to her type, rhythm and work ethic and always gives her best effort. 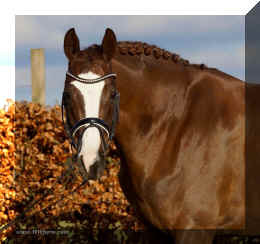 This stunning horse has all, the looks and the personality a person could ever hope for. 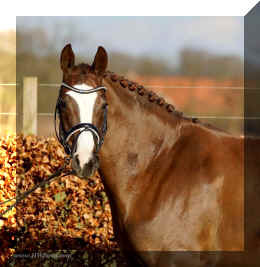 Super pretty head, perfect set on neck and superb conformation. 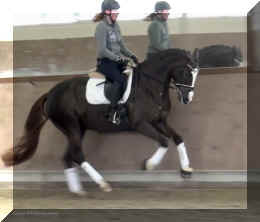 Her athleticism and lady like attitude, is nearly indescribable. 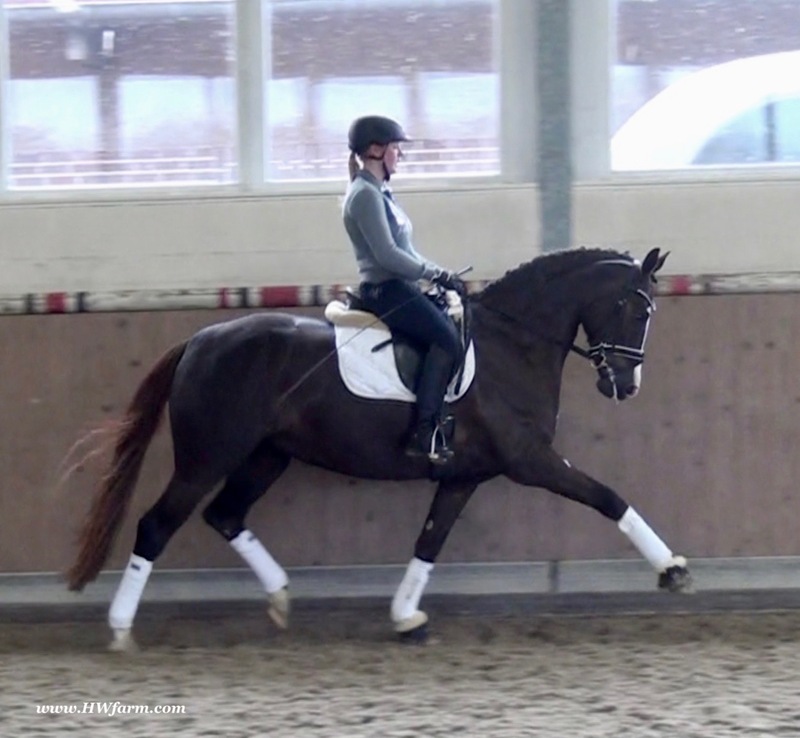 This lady is very easy to ride, with a soft mouth and lots of impulsion. 2nd level is easy for her, she will go up the levels in no time. 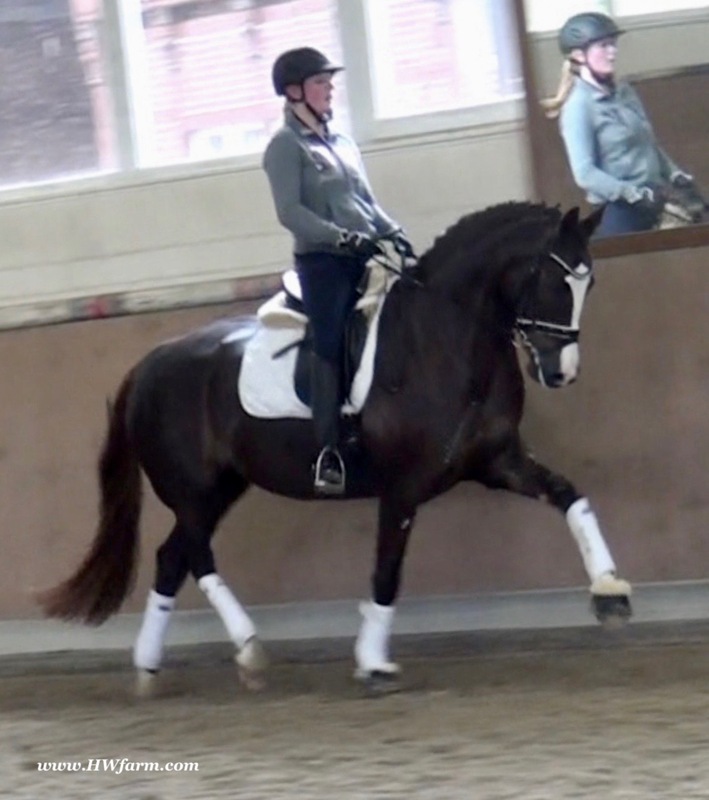 She eagerly works under saddle and is all concentrated on her job in the dressage arena and with her quick, far reaching hind leg, passage and piaffe will come naturally to her. She was ridden inside and outside and doesn't mind heavy farm equipment being driven around him during her work session. 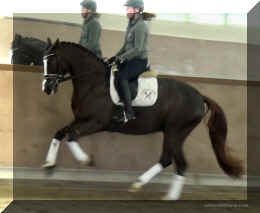 Quality Time HW is incredible supple and has a ton of air time. She just floats above the ground. With her free shoulder and huge grundschwung, she swings nicely through her back and is easy to sit. This extremely talented girl has definite international potential, is fun to ride and trustworthy. This is an uncomplicated young horse, on the ground and under saddle. 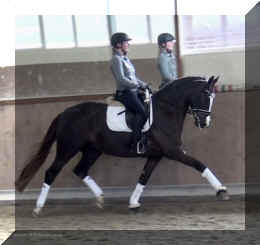 Truly a perfect ride for an amateur, YR or professional alike, all will enjoy her just the same. 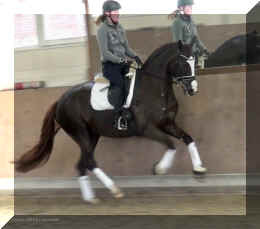 You just can't beat her personality, gaits, looks and temperament. 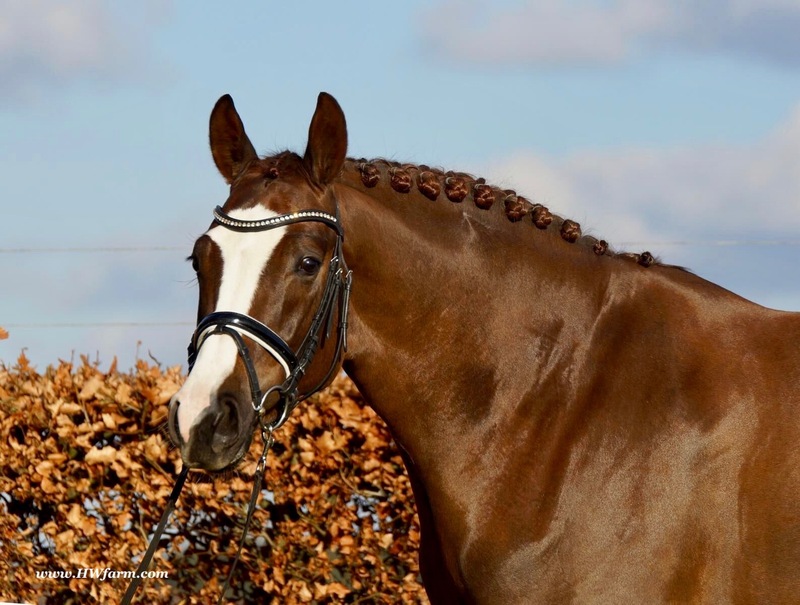 This stunner will go far in the dressage ring, she is your ticket to the top! She was always handled and trained correctly. With this horse, you will be the star in FEI classes and at clinics, the judges and onlookers will remember her where ever she goes. Her bloodlines are very much sought after. Quality Time HW, a horse that has it all and loves to give it all, used to go in the hot walker, loves her shower and solarium time. Stands for the farrier, loads and appreciates her personal grooming time. This one is as sweet as a puppy dog, but with the attitude of a real lady. 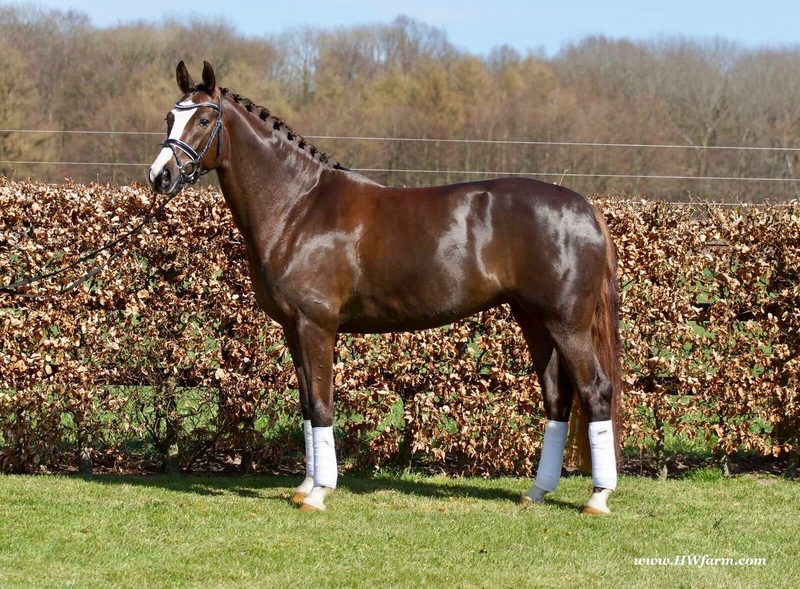 Buy her now and show her yourself in the Young Horse Championships or take her to the BundesChampionships, embryo transfers come to mind too! check out her video clip!! !